The silver dollar coin struck by the U.S. Mint from 1878 to 1921 was known as the Morgan dollar after its designer, George T. Morgan. The coin was minted in several locations over its lifespan, including Carson City, California. The coin features a profile of Lady Liberty on the front and an eagle on the reverse. The mint mark of each Morgan silver dollar can be found on the reverse below the wreath. Coins minted in Carson City feature the mint mark "CC." The coin is composed of 90 percent silver and 10 percent copper, with .77 oz. of pure silver. The Morgan dollar weighs nearly 27 grams and has a diameter of 38 mm with a reeded edge. The Morgan dollar was minted in Carson City, Philadelphia, San Francisco and New Orleans initially. Production at the Carson City mint stopped in 1893. Congress suspended coinage of the silver dollar in 1904 but resumed it in 1921, when the last Morgan silver dollars were produced. The Morgan gave way to the new Peace dollar design later that year. Morgan dollars aren't that difficult to find in higher grades, in coin-collection terms, because they were not circulated as much as lower-valued coins. A Morgan dollar with little wear and a nice luster can grade as choice uncirculated (MS-63) or higher. With some wear on Liberty's face or the eagle's wings or breast, the coin would grade as about uncirculated (AU-50). More wear on the eagle would knock the grade down to extremely fine (EF-40). If several of Liberty's hair lines are worn and the eagle's feathers are well worn, the coin would grade as very fine (VF-20) or lower. 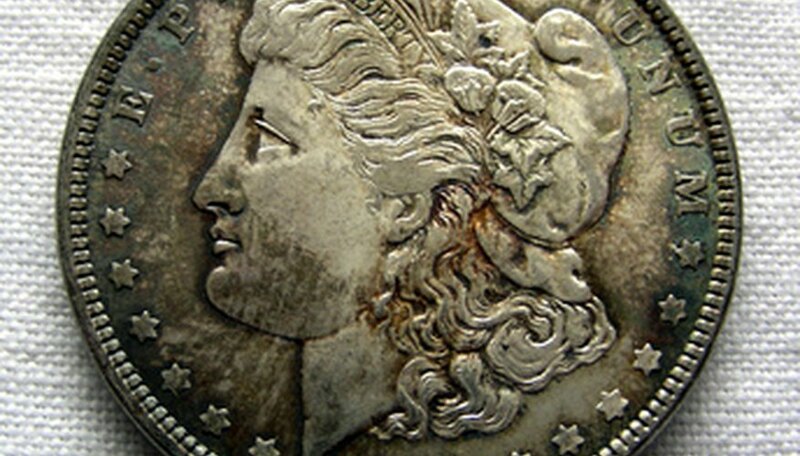 The 1880 Carson City-coined Morgan dollar features some rare misstrike errors that carry premium prices among collectors. Some of the initial batch of coins that year carried the date "1879" and were corrected with the correct date by stamping "80" over the "79." While most Morgan dollars from this year are valued at around $25 in VF-20 condition in 2010 prices, the rare Carson City error coins can be worth upward of $200 in the same condition. How Do I Tell the Mint of a Morgan Silver Dollar?